The SAO team is delighted to announce that our unit Galaxies and their Place in the Universe won a 2014 NOVA Awards for Online Learning Excellence sponsored by Open Universities Australia. The unit design principles of Open Universities Australia for which the NOVA is awarded are centred on authentic, adaptive, personalised, collaborative and supported learning. Our SAO unit Galaxies and their Place in the Universe provides an interactive, authentic and supportive learning environment via (i) the innovative use of online interactions & collaboration, (ii) assessment in an authentic context, (iii) appropriate & comprehensive learner support, and (iv) the use of technology for sound education outcomes. As well as providing real-world hands-on activities which allow students to explore and discover the universe for themselves, Galaxies and their Place in the Universe is one of three introductory SAO units that contains interactive 3D PDFs. The 3D PDFs, created using the Swinburne-designed S2PLOT package by David Barnes, Christopher Fluke and collaborators, allow students to interact with and explore complex 3D geometries and astronomical datasets. 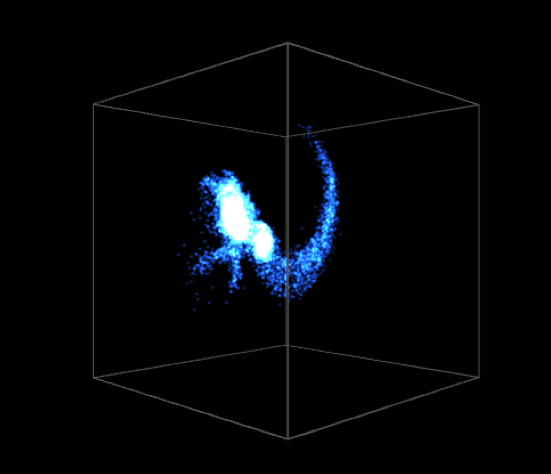 An example of one of our 3D PDFs of interacting galaxies can be found below. The NOVA awards were announced at the 2014 Education Frontiers Summit in Melbourne last week. The SAO team submission was authored by Glen Mackie, Sarah Maddison, Chris Fluke and Artem Bourov. Huge congratulations to you all. This is wonderful news. This subject was one of my favourites so far so it’s great to see it, and SAO, getting this kind of recognition.